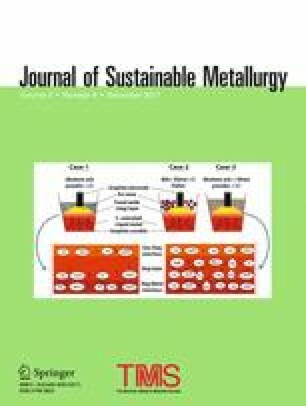 The present paper deals with the effect of charge material on the recovery of aluminum from the industrial solid waste. For the efficient recovery of aluminum metal having a lower vaporization temperature, smelting was carried out in the presence of metal (iron) solvent bath inside a graphite crucible. Nitrogen plasma arc was generated by passing the current as well as the nitrogen gas through a hollow graphite electrode. Charge containing bottom ash or a mixture of iron ore slime and bottom ash along with a reductant of different reactivity was used either in the form of powder or pellets. Liquid iron bath below the plasma arc zone was utilized as a solvent for the absorption of reduced metals after reduction of the oxides present in the wastes. The quick absorption of aluminum in the liquid iron bath subsequent to the reduction of oxides under an inert atmosphere minimized the vaporization loss of aluminum. The effects of carbon content and its reactivity, form of charge material, charge-layer thicknesses for different charge compositions on the recovery of aluminum were studied for 30 min of plasma exposure times in all cases. Maximum recovery of aluminum was found for the charge in powder form having a mixture of bottom ash and iron ore slime along with the increased carbon content as well as charge-layer thickness, respectively. The recovery of aluminum was found to be up to 40.80% for the powder charge containing 50% bottom ash and 50% iron ore slime with the char in double stoichiometry carbon. The contributing editor for this article was Veena Sahajwalla.